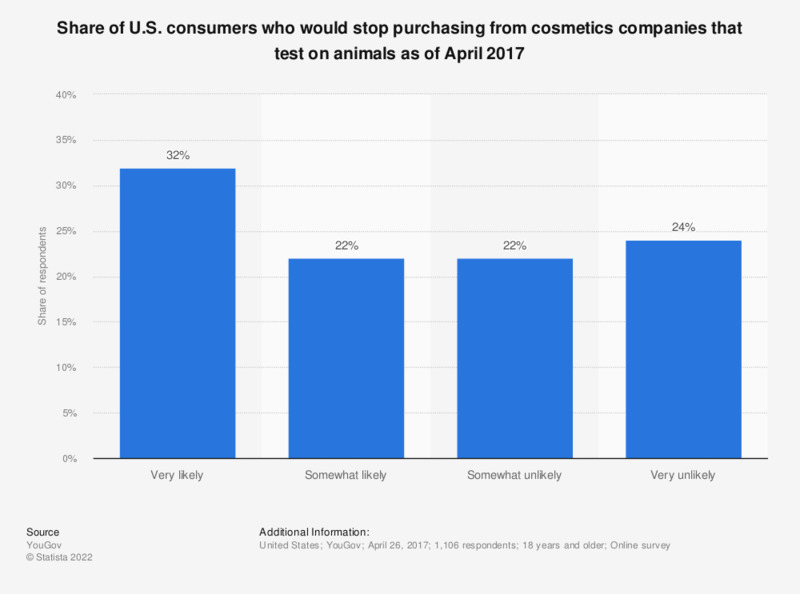 This statistic shows the likelihood of consumers in the United States to stop purchasing from their favorite cosmetics/makeup brand if it were reported that the brand test their products on animals, as of April 2017. During the survey, 32 percent of consumers reported that they would very likely stop purchasing from their favorite brand if they tested on animals. This question was phrased by the source as follows: "Please imagine that your favorite makeup/cosmetics brand was reported to test it's products on animals. How likely or unlikely would you be to stop purchasing that brand?" Everything On "Cosmetics consumer behavior in the U.S." in One Document: Edited and Divided into Handy Chapters. Including Detailed References. What is the share of organic personal care and cosmetics products of all products you purchase from the category makeup?